LCD Wallboard is an web application for a clear display of the immediate status of the call center. It is optimized for LCD screens but works in regular computer screen as well. Many of our customers use Wallboard on dedicated LCD screen, where they mostly show information about achieved SLA on queues, call rates, call statuses from the telemarketing campaigns, actual status of operators or helpdesk performance. Each Wallboard is made up of predefined widgets and the team-leader can assemble it himself precisely tailored by the help of a few mouse clicks. 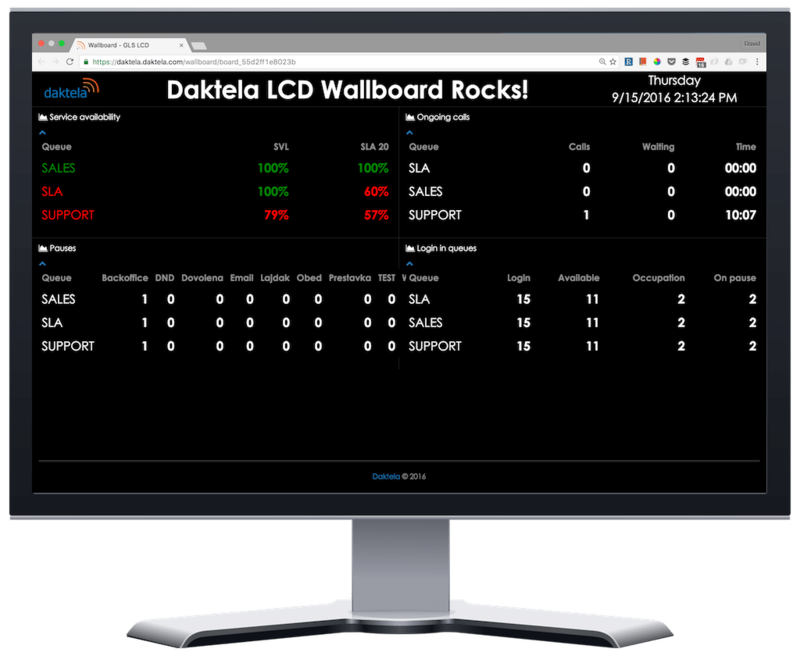 Daktela Wallboard offers many predefined statistical widgets which can be used to build fully customized Wallboard configuration. Statistical widgets are available across all communication channels. Daktela wallboard enables on each widget set the timeframe from which statistics are calculated - for example, from today's midnight or for the last hour. Daktela Wallboard can be used on almost any device that supports a web browser. Our customers use Wallboard on LCD screens, projectors or PC monitors. Daktela platform calculates all statistics in real time and thus, also Daktela Wallboard displays actual information without any delay. Daktela wallboard enables for some widgets set KPI's values and if the resulting statistics are worse than expected, the given statistic is highlighted in a different color. At first glance you can see that there is something going on in the call center. Daktela Wallboard allows for each wallboard set a text which is periodically rotated and displayed on the resulting wallboard. Daktela contact center is a cloud-based solution of call center with native support for many communication channels "OmniChannel" in one Web application - phone, email, helpdesk, Webchat, SMS and social networks.